With combined backgrounds in,law, economics, insurance and healthcare, Jamian and Boyajian created a company that now serves as the gold standard for health services in Southeast Michigan. The commitment to follow their vision of building a niche company that would serve a unique purpose in the Michigan healthcare industry provides much sought after, homecare nursing, home medical equipment, specialized IV pharmacy therapies, consulting and medical staffing. 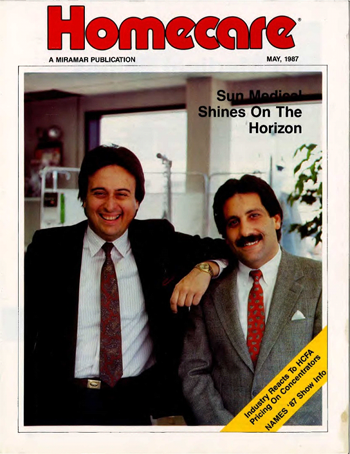 In 1979, AmeriCare Medical started to build its premier portfolio of companies with Sun Medical Equipment Company, which is a full-line home medical equipment company offering products and services to hospitals, clinics, managed care companies, insurance companies and patients. Soon to follow was Bloomfield Nursing Services, and Pointe Nursing (now AmeriStaff Nursing Services) which employed registered nurses and home health aides..RxiV Pharmacy was soon to follow and delivers today a total spectrum of cost effective infusion pharmacy services and therapies to patients in institutions and their homes. AmeriCare’s growth and strength over the last 36 years has been a steady incline with many major accomplishments throughout the past 36 year’s history. Today AmeriCare Medical enjoys the stellar reputation as Michigan’s leader in comprehensive healthcare management and specialized homecare services. Known for its high standards of excellence in medical staffing, private duty nursing, durable medical equipment and pharmacy services, AmeriCare’s client list includes major hospitals, Insurance companies, Unions and governments programs. AmeriCare’s subsidiary, Sun Medical Equipment Company, now has three locations; a stand-alone store in Washington Township, a location on the first floor concourse of St. Joseph Mercy Oakland Hospital in Pontiac and the Troy warehouse which is open to the public.. AmeriStaff has provided employment, education and training opportunities for over 2,000 medical personnel in Michigan throughout its duration, and our services are available to patients and clients on a 24 hours a day, seven days a week basis, including holidays.